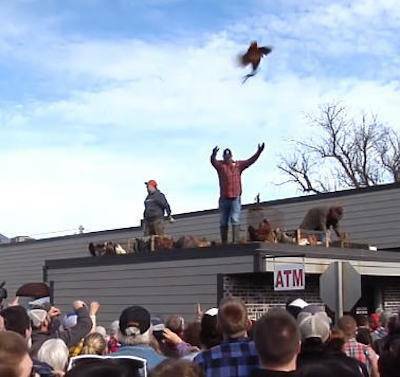 In Ridgeland, Wisconsin this February, an event called Pioneer Days will feature a “chicken toss” during which over 200 live chickens will be tossed, one by one, into a crowd of attendees. Each person (adult or child) who catches a chicken gets to keep the chicken. The sheriff's office says the event will still happen, but they will make sure the chickens don't get hurt. We know that's not likely - if they aren't physically hurt, they will be terrified getting thrown from a roof. They avoid talking about the 'pig chase'. They need to hear from us again. Watch VIDEO of 2017 Pioneer Days Chicken Toss. The event is sponsored by Drunk’n Monkey Bar and Hotel. Wisconsin Crimes Against Animals statute 951.02 states that “no person may treat any animal, whether belonging to the person or another, in a cruel manner”. As if this isn’t bad enough, during the same event pigs are frightened and chased by large groups of children. Another example of the meanness of this event. United Poultry Concerns is joining Wisconsin-based Alliance for Animals in urging the village of Ridgeland, Wisconsin to cancel their February “Chicken Toss” due to its cruelty to defenseless birds in frigid temperatures. The “chicken toss” consists of throwing chickens, one or two at a time, up in the air from a tavern roof. Crowds scramble to grab the birds as they fall to the ground. The chickens are huddled freezing and fearful together in crates and bags awaiting their mistreatment by villagers who consider this animal abuse fun. There is no similarity between a chicken being pulled from a container and thrown roughly up in the air from a roof, and a chicken fluttering to the ground voluntarily from a perch. In addition to the physically cruel conditions is the heartless attitude toward the birds. It’s time for Ridgeland to quit this cruel, moronic entertainment. They shame themselves by acting like village idiots, abusing helpless animals for fun, and teaching their children to be vicious bullies.